Emeralds are the most well-known green gemstones. They symbolize royalty, romance, and intrigue and are available in different colors. The colors range from Greenish-Blue to Bluish-Green making them exceptional amongst other gems. Emeralds unlike other gems like Diamonds can be graded using the naked eye though their resistance to breakage is generally poor. Similar to other colored gemstones, four basic parameters are used to grade Emerald. These are the four Cs of Connoisseurship: Color, Cut, Clarity, and Carat weight. The term water was being used before the 20th century to express the combination of two qualities: color and clarity. Customarily, color is by far the utmost vital criterion used to grade all colored gemstones but clarity is a close second when grading Emerald. However, both conditions are necessary. The finest Emerald must have a pure verdant green hue and a high degree of transparency to make it a top gem. In the 1960s, the definition of the gemstone was changed to comprise the green vanadium-bearing beryl as emerald by the American jewelry industry. This made the UK and Europe not recognize as such vanadium emeralds bought as emerald in the United States. The term “Colombian Emerald’’ reflects the distinction between traditional emeralds and the new vanadium kind in America. Three components make up color in gemology: hue, saturation, and tone. The gemstone occurs in hues ranging from blue-green to yellow-green though the primary hue necessary is green. The normal secondary hues found in Emeralds are blue and yellow though those considered as Emerald are medium to dark in tone. 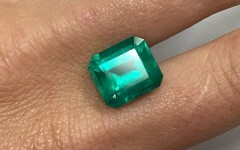 Green beryl is a species name for light-toned gems. Finest Emerald should be well structured: the hue should be bright (vivid). Nonetheless, the normal saturation modifier is Grey or mask comprised in emerald. Grayish-green hue is a dull hue. By definition, Emeralds are green. The name was derived from the ancient Greek word smaragos which means green. They are a green range beryl, a mineral that comes in many different colors which are at times used as gems. These include; yellow heliodor, blue aquamarine, red beryl, pink morganite, bixbite, and colorless goshenite. The gemstone tends to have surface breaking fissures and numerous inclusions. Its clarity is graded by eye unlike diamond where the loupe standard is used. 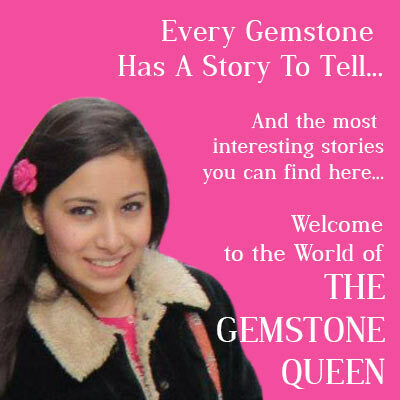 The gemstone is considered flawless if it has no visible inclusions to the eye. They are all treated “oiled’’, to enhance the outward clarity. 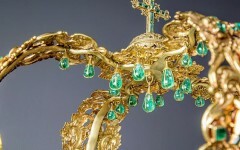 Sometimes the inclusions and fissures comprised in an emerald are described as “Jardin’’ due to their mossy appearance. The imperfections comprised by every stone are unique and are sometimes used to identify a particular stone. Those that command the highest price are always clean to the eye, and have less than 15% of any other combination or secondary hue (either yellow or blue) with a medium dark tone. They are easier to cut into cabochons rather than faceted shapes unlike other gemstones due to their relative crystal non-uniformity. 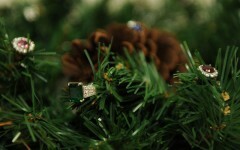 The Oval and Signature Emerald cuts are commonly given to faceted emeralds. Many Emeralds are treated by being oiled in order to fill in surface-reaching cracks. This improves their clarity and stability. Cedar oil and other liquids with close reflective indexes to Emerald are used. They have been mined in Egypt since 1500 BCE, India, and Austria though Colombia is the world’s largest producer of the gemstone constituting 50-95% of the world’s production. Tis the season to be jolly, tra le la le la le la le la!